Wawn Street Surgery receptionist Nicola Porter and staff have been collecting for Hope and Hospitality food bank in South Shields. Generous staff and patients at a South Tyneside doctor’s surgery have come together to make a difference to the lives of those in need this Christmas. Wawn Street Surgery South Shields has been collecting food, clothing and toiletries to donate to the Hospitality and Hope Food Bank on Hampden Street in South Shields. Receptionist Nicola Porter, 25, came up with the idea to help those who are struggling by starting a collection at the surgery. In just a matter of months she has been overwhelmed with the amount of support the appeal has received. Nicola, who has been at the surgery for two years, is expecting her first child in March, and says her new perspective on family has really hit home - inspiring her to start the appeal in her workplace. 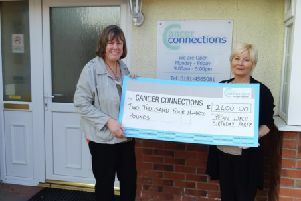 She said: “We started the appeal about two and a half months ago to help food bank Hospitality and Hope over Christmas. “Since then we have collected about 15 boxes worth of food, clothing and toiletries, through donations by staff and patients. “I came up with the idea because I just wanted to do something to help people. “I am pregnant at the moment, and it has made me think about families who may be struggling. Hospitality and Hope is a Christian charity providing help to homeless and needy people in South Tyneside. Founded in 2002 the charity provides services run by volunteers that include a food bank, clothing bank and soup kitchen to support people during times of need. It also offers continued long-term support through shared living accommodation, various well-being projects and a coffee shop called Chai Coffee House which provides volunteering opportunities, equipping people for future employment. In October 2017 the Hospitality and Hope was presented with the Queen’s Award for Voluntary Service from Princess Alexandra. The award is the highest which can be given to volunteer groups.